This is a very exciting news! 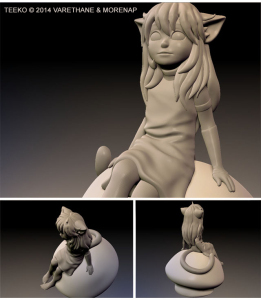 I’m collaborating with Ally Rom Colthoff (aka Varethane) to her Kickstarter campaign, with aim to print her webcomic Chirault, with the 3D sculpture of one of her comic main characters: Teeko (see pics below). For 250$ you can pledge for one figurine (3d printed by Kym), including a copy of her comic Chirault volume 1 with signed bookplate, plus prints, minicomic, wallpaper and PDF! But hurry, only 6 days left to go! I’ve also made a post on my Tumblr and Facebook pages if you’d like to share around! Here a wip of the 3D model and the 1st Teeko 3D print!